Following my post about the increase in algal “gloop” (see “Is algal gloop on the increase?”), I thought it would be interesting to show some of the organisms responsible for this “gloop” at higher magnification. Chris Carter provided the images. First of all, there are some images of the green alga Coccomyxa confluens, one of the organisms mentioned in my previous post. Under the microscope, the mucilaginous masses can be seen to consist of large numbers of solitary cells, each with a single chloroplast wrapped around the margin, embedded in the mucilage. But what is particularly interesting about these specimens is the fungal hyphae that weave through the mucilage. 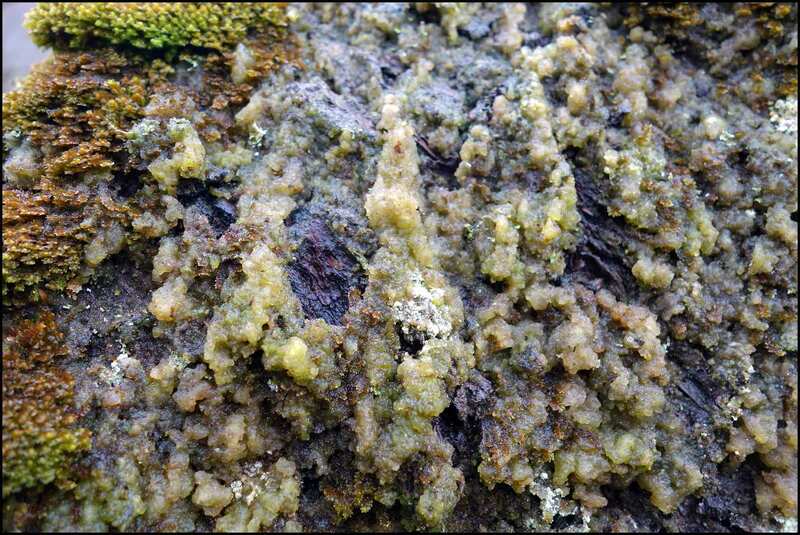 Coccomyxa can be found both as a free-living alga but also as the algal partner in a lichen. I wrote about lichens last year (see “Discovering a liking for lichens …” and “It takes two to tango …”) and speculated about their origins. The image of fungal hyphae weaving through the mucilaginous mass re-ignites this curiosity. Broadly speaking, the lichen symbiosis is not a meeting of equals: the fungal partner cannot live without the alga but the alga can survive without the fungus. The fungal partner is capable of sexual reproduction but once the spores arrive at a suitable habitat, they need to find some algal cells in order to thrive. A free-living mass of Coccomyxa is, therefore, the perfect place for a tiny wind-blown lichen spore to land. Maybe that is what we are seeing here: the start of a beautiful relationship? Coccomyxa confluens, photographed by Chris Carter. Left: macroscopic view of mucilaginous masses; right: microscopic view showing individual cells along with fungal hyphae. The second representative of the “gloop”-forming algae is the desmid Mesotaenium macrococcum. We’ve met desmids a few times in this blog (see “Hunting for desmids in Upper Teesdale”) but Mesotaenium does not have the elegant, symmetrical outline of most desmids with a central constriction. It belongs to a group called the “saccoderm (or false) desmids”, which is a family in the same sub-order as the filamentous algae Spiroygra and Mougeotia which we’ve met elsewhere in this blog. By contrast, most of the desmids such as Closterium and Micrasterias, which we met in Upper Teesdale, belong to the “placoderm” (or true) desmids”. The exception is Netrium, which is also a saccoderm desmid. In Upper Teesdale, I was hunting for desmids amongst Sphagnum in bog pools; Mesotaenium, by contrast, is a species that can live in situations where it is not permanently submerged. Once again, the mucilage offers protection against desiccation. Mesotaenium macrococcum, photographed by Chris Carter: left: medium-power image showing mucilaginous masses; right: high power image showing the simple chloroplast. Finally, another green alga, though we are not sure what this one should be called. Chris and I contemplated the genus Palmella but this seems to be a name that has fallen out of favour recently. Species formerly included in Palmella can be found in both the Cyanobacteria (now species of Aphanothece, Chlorogloea and Gloeothece) and Chlorophyta (now Trochiscia) so we are clearly not the first people to struggle. However, Chris has highlighted a small eye-spot and also the beginnings of a flagellum, which suggest that this is the resting stage of a motile Volvocale rather than a permanently sessile organism. Chris commented that this specimen came from a wetter habitat than the Coccomyxa and it may be that this is the resting stage of an organism which, when conditions are favourable, lives freely in the water, rather than forming mucilaginous masses. Resting stage of a Volvocalean alga, photographed by Chris Carter; left: low-power image showing mucilaginous masses; right: high power image with (inset) cells with eye spot and the start of a flagellum highlighted. Is algal gloop on the increase? This post summarises a series of emails that piqued my interest last week. The first was from Paul Brazier of Natural Resources Wales, asking for information about terrestrial algae. Behind the query lay a concern amongst some bryologists that the quantities of gelatinous algae in some habitats in the west of Britain was increasing and threatening rare mosses and liverworts found in these places. He quoted bryophyte expert Nick Hodgetts who has recorded less of the rare moss Sematophyllum (Hageniella) micens who had also noted that the sites where he once found it now have a great deal of algal slime. Other experts had confirmed this trend, and expressed concerns that it was out-competing small oceanic mosses and liverworts. Des Callaghan, another bryophyte specialist noted that a “gelatinous gloop” (which turned out to be the green alga Gloeocystis polydermatica) had overwhelmed the rare liverwort Lejeunea patens at Glen Trool in Galloway, south-west Scotland. Des also gave me the photograph below, showing the gelatinous algae Coccomyxa confluens on Betula pubescens, competing for space with the neighbouring oceanic liverwort Scapania gracilis. He commented that at this site (Gallwyd, near Dolgellau, in North Wales), the algae is most abundant in the most humid locations, notably in the mist zone of the main waterfall. It appears that, at least here, it is a normal part of the flora and isn’t so abundant that it is something to worry about. At other sites, though, these terrestrial gelatinous species can be much more abundant. The other photograph Des sent shows another green alga, Klebsormidium growing on heather (Calluna vulgaris) at Wybunbury Moss in Cheshire. I described Klebsormidium in one of my posts about the River Ehen (see “The River Ehen in November”) noting how it was often found in habitats that were not fully submerged although I had not previously seen it competing for epiphytes on terrestrial plants, as Des’ image shows. Des directed me to some circumstantial evidence that Klebsormidium may benefit from high N-deposition. Interestingly, Glen Trool, mentioned above, is close to Round Loch of Glenhead, the subject of intensive studies on the causes and consequences of acid deposition by Rick Battarbee and colleagues at University College London. These studies have shown a gradual recovery from the worst effects of acid deposition since the 1980s but the decline in sulphur-containing compounds has been more significant than the decline in nitrogen-containing compounds. They suggested that one result is that Galloway lochs such as Round Loch of Glenhead may, as a result, be slightly more nitrate-rich now than in the far past. Until very recently, the effects of this extra nitrogen was masked by the generally negative consequences of the acidity but now the sulphur deposition has reduced, it is possible that the algae are able to benefit from this nitrogen and thrive at the expense of other plants. Whether the same may hold true for the terrestrial and semi-terrestrial vegetation in the surrounding woods must remain speculation for a little longer but it may help to explain why bryologists are seeing more algae at locations where they hoped to find rare bryophytes. 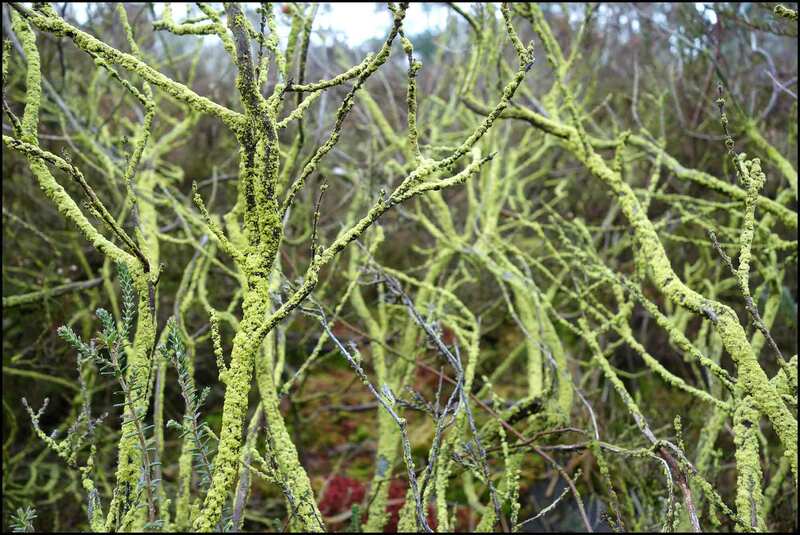 The green alga Klebsormidium growing on Calluna vulgaris (heather) at Wybunbury Moss, Cheshire, March 2015 (photo: Des Callaghan). Battarbee, R.W., Simpson, G., Shilland, E., Flower, R.W., Kreiser, A., Hong, Y. & Clarke, Gina (2012). Recovery of UK lakes from acidification: an assessment using combined palaeoecological and contemporary diatom assemblage data. Ecological Indicators 37: 1-16. Kelly, M. (2012). The semiotics of slime: visual representation of phytobenthos as an aid to understanding ecological status. Freshwater Reviews 5: 105-119.